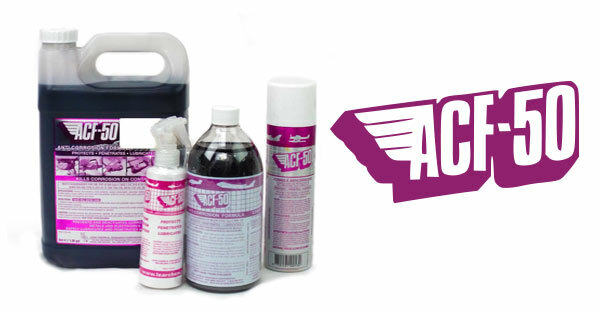 Originally developed for aircraft, ACF–50 has been adopted by the motorcycle industry due to its outstanding performance. This miracle anti–corrosion lubricant chemically neutralises road salt and makes water bead on contact, so that it literally bounces off your bike. This makes it ideal for use during winter, or for those who store their bike away and wish to protect it from the damage moisture can cause. As well as preventing corrosion, ACF–50 slows down existing corrosion with its 12–month active life. It contains no high–pressure lubricants, wax, silicon or Teflon additives. Nor does it contain any water, and it's suitable for use almost anywhere on your bike, including the electrics. Being a non–flammable propellant, ACF–50 will spray like shaving foam when it is cold. Be sure to keep the tin in a warm place, and shake well to active the propellant before use. Each application goes a long way. After shaking the ACF–50, spray the lightest coating you can to the structure of the bike, joints and welds, under–panels and hidden parts of the engine, radiators, engine cases, forks, calipers, wheels, screws, bolts, electrics and anywhere else you like, except for your braking system as this can be highly dangerous. When sprayed onto the surface, it creeps to where it's needed. You can work into hard–to–get places with a paint brush or toothbrush. Then use a rag to spread it over the areas you've sprayed it on. How long will ACF–50 last? ACF–50 will remain active on hidden areas, such as under the tank, for up to a year. It will need to be applied to exposed areas more frequently. You can tell whether it needs to be reapplied as water will no longer 'bead' on contact.